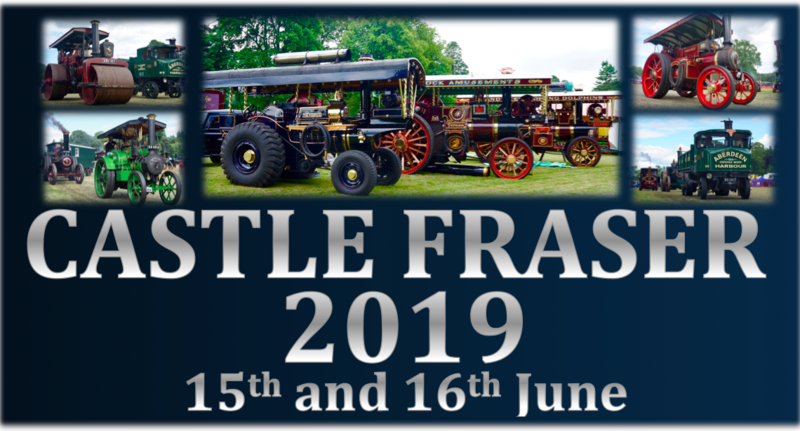 The Steam Fair is an annual event, and since 2004 our fair site has been at Castle Fraser. Since relocating the event has grown in size over the years and in 2010 the club celebrated their 40th Anniversary, with 40 full-size engines present and many more attractions on site. Our 45th anniversary year was celebrated in 2015, with an impressive line up of over 45 full-size engines, along with many other classic and vintage vehicles. The poor weather in June 2016 saw us have to take the sad step of cancelling our annual Steam Fair, this was not a decision that was taken lightly, the committee and supporters of the club all worked hard to deliver what was an excellent weekend in 2017. We are currently in the process of planning for 2019! Where can I get an exhibitor entry form? You can enter your steam, vintage or historic exhibit online, by email or by post. We’d love you to use our new online entry form but if you’d prefer a good old fashioned form just download one over on our exhibitors information page and either email or post it in to us. Admission Prices for our Steam Fair are on the main visitor information page here. What time does the steam fair start? The gates open to the public at 10am both days, with the fair closing at 4pm on Saturday and packing up begins around 3pm on Sunday. Steam engines are usually up to full pressure by 11am but if you’re keen to try out some of your photography skills get in early to avoid the crowds! We love dogs! As long as you keep your dog on a lead, they are welcome to come to the Steam Fair with you just bear in mind that the whistles can be loud! We do ask that you please remember to clean up after your furry friend and dispose of appropriately.